This house-by-house map of when each building in Brooklyn was built is amazing. BKLYNR | Block by Block, Brooklyn’s Past and Present. Muji Store, originally uploaded by micahcraig. 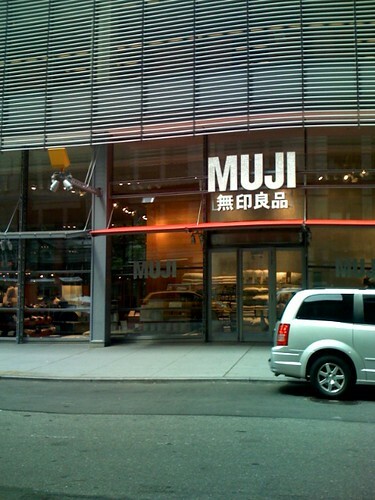 I stopped by the new Muji flagship store on a mini Japanese retail pilgramage to Times Square. The New York branch of Kinokuniya moved to 40th & 6th from Rockafeller Center a few months ago, and I also visited their new store. Both stores were great, but the Muji store, despight the great light, open plan, and glass shelving, still seemed too small for the range of their products. The flagship Muji store in Tokyo is enormous, and even includes a grocery section. If they opened a store like that in Brooklyn I might never shop anywhere else. 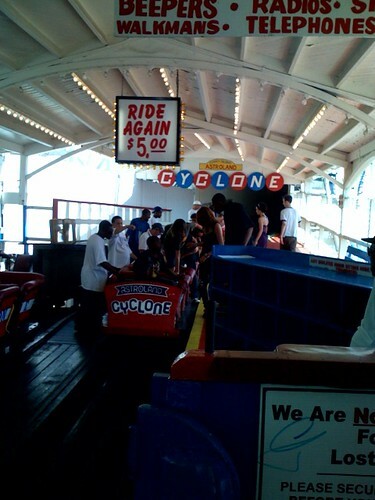 Cyclone!, originally uploaded by micahcraig. Happy belated New York Stonehenge Day everyone. Today, if it is clear, Manhattan will flood dramatically with sunlight just as the Sun sets precisely on the centerline of every street. 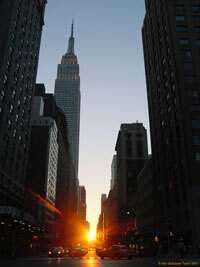 Usually, the tall buildings that line the gridded streets of New York City’s tallest borough will hide the setting Sun. This effect makes Manhattan a type of modernStonehenge, although only aligned to about 30 degrees east of north. Were Manhattan’s road grid perfectly aligned to east and west, today’s effect would occur on the Vernal and Autumnal Equinox, March 21 and September 21, the only two days that the Sun rises and sets due east and west. If today’s sunset is hidden by clouds do not despair — the same thing happens every May 28 and July 12. Look, Brooklyn is hard, and we protect our own first and ask questions later. Don’t forget it. This is the very best use of Google Maps I’ve yet seen. Makes the Jack Tracker look posatively uninspired. Old maps are almost as exciting as typography –L.N.R. Girl in bathroom: Well, my friends live out here, but I’m from Manhattan, so I asked them what I should wear and they said this place was really casual. So I asked if I could at least wear heels..and they said no…but I can’t drink in sneakers!